Entrance in Columbus Courtyard E14 4HD but it is not easy to find on first visit. DLR (Docklands Light Railway) You can go to Westferry Circus and walk along the main road. 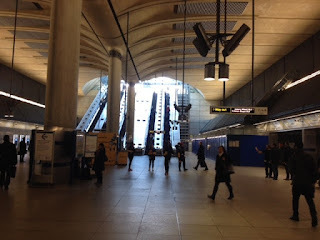 A drier and less polluted route is going to Canary Wharf Station on the DLR …. and then finding the right exit from the shopping area. When you come down from the platforms, you find yourself in a sort of concourse with a large star style decoration on the floor and a small departures board above. The exits do not have numbers but the one you need has a large Platform 6 just to the right of it. To the right of that is a Paddy Power. Go though those doors straight ahead. 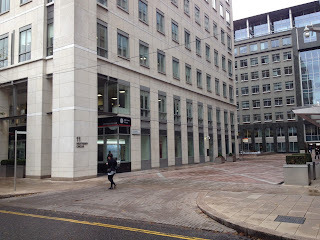 Go round the side of a food outlet Birley and then on past shops, Moleskin, Zara, Space NK, Crabtree & Evelyn etc, until out the doors at the end - into the air- Cabot Place West - you are then opposite steps up to a fountain in Cabot Square. You might spot a small signpost on a pole on the pavement which is opposite a pedestrian turning called Columbus Courtyard. There is a fairly obvious sign saying 11 Westferry Circus on the wall. A few metres into that, on the left is an inconspicuous entrance to the court with a steel court sign on the wall. The door is labelled encouragingly Firefighters Access. Keep Clear. If you come to Tom's Kitchen - you have gone a bit too far. Below is the view off the main road and the court is along on the left with two small plants outside it. Security staff will check your bags and you will have to go through a scanner so you need to take all metal objects out of your pockets and put them in the trays provided. You will not be allowed to take into court any large umbrella, cigarette lighters, any sprays like perfume, any glass bottles, metal cans or any plastic drink bottles that have been opened - ie they need to have intact seals. Security staff will take them, and give a receipt for collecting on the way out. They will also tell you which court you are in. You will need to take the lifts to the 6th or 7th floors. By tube to Canary Wharf on the Jubilee Line. Make sure you come out of the exit with signs to DLR. Go up these escalators or use the lifts. When you come up the escalators you are in an open area with water ahead of you and to your right a plaza with restaurants and stalls and a large office block rising up ahead. Turn right into the plaza and go up the steps ahead - or there is a lift to the left of the steps - and you will come out onto South Colonnade. Turn left and follow that along until you come to Cabot Place - the large square with the fountains and waterfalls. Keep going ahead, round the outside of the square until you come to the dual carriageway of West India Avenue. Cross at the crossing to the other side and turn left away from Cabot Square. The court is then 100 metres on the right - see above for final directions and picture. If that is too small …. and you are looking at this online go to this page and print out a larger version. Access for wheelchairs and buggies: There are powered doors and lifts in the Tube stations and the DLR (which has level access platforms). From the DLR lifts you need to make sure you go to the bottom level. 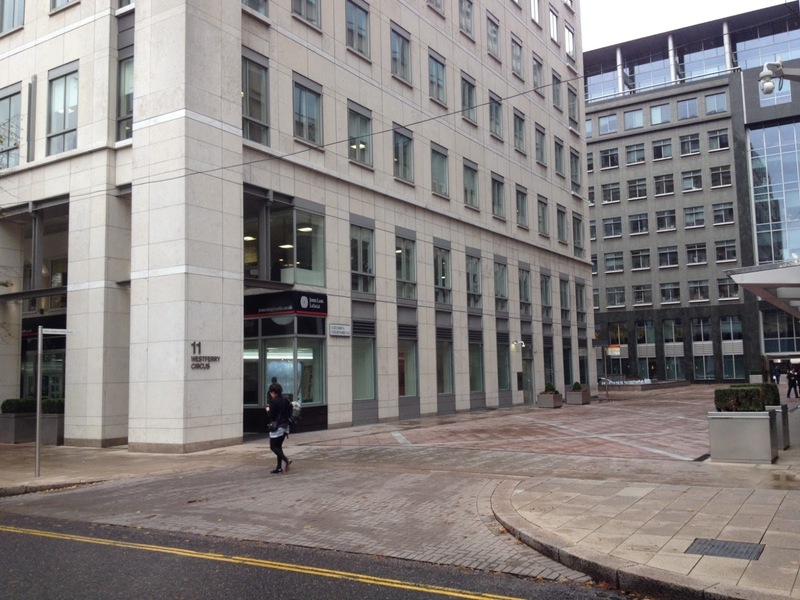 You will come out on South Colonnade where there are dropped kerbs but cross the road and stay on the left side skirting Cabot Square which does not have full dropped kerbs. From the tube, coming out onto the open plaza - there is a lift somewhat tucked away beside the steps up to South Colonnade. 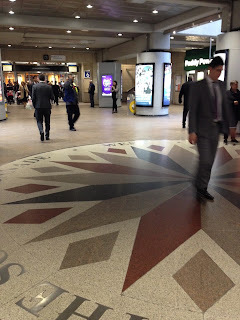 Riverboat: It takes 30 minutes from Waterloo to Canary Wharf and 29 minutes from Woolwich to Canary Wharf. Key stops include Westminster, Embankment, Blackfriars, Bankside, London Bridge and Tower Piers to the west and Greenland, Masthouse and Greenwich to the east. 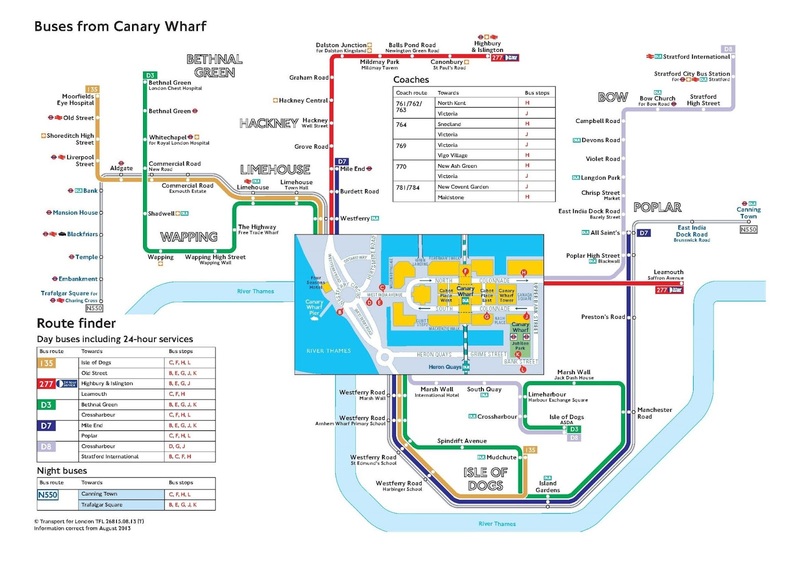 A shuttle service from London Bridge to Canary Wharf (13 minutes) also operates every 10 minutes in the peak hours. In addition to the regular services a shuttle service operates between Surrey Quays and Canary Wharf. Oyster cards are now accepted for Pay-As-You-Go payments on river bus services. The Canary Wharf pier is located close to Westferry Circus. Come out of the court and turn right up West India Avenue - up to the roundabout, across to the other side and the pier is there. £7.15 to Embankment. Photocopying: There is an excellent and very helpful branch of Color Co in South Colonnade. Andrea, Mark and Claud. To reach it - from DLR follow the instructions above and then when you emerge into the fresh air of Cabot Square turn left along the pavement, cross South Colonnade and it is back a few metres to your left. From the tube you will pass it on the way along South Colonnade. You may find it convenient to e-mail in your documents for printing so you can pick them up on the way to court. canary.wharf@color.co.uk Note American spelling of color. Not very cheap 14p per sheet. However they have just introduced a £15 minimum charge which amounts to about 90 pages. So …there is also rather less professional photocopying available at Rymans in the shopping centre - off Platform 2 of DLR. They will also receive incoming emails with documents. It’s up to you to ensure confidentiality but they assure me they are aware of security and will delete as soon as possible and keep documents safe. £2 cover charge Canarywharf@rymanservices.co.uk Obviously they have stationary and are next to a Waterstones and a Maplins which can be useful. The Post office does do copying but you have to join a usually lengthy queue and hand over documents which they copy. 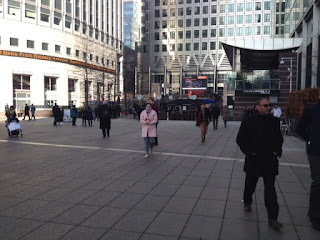 Food: There are many restaurants in Canary wharf - some no doubt very good and very expensive. For the rest of us…. Prêt a Manger is two minutes from the court. Come out, turn left, then angle left across the courtyard and you will see it. If you prefer something different and a bit cheaper - go past Prêt, turn right along the row of shops and there is a Benebene shop - sandwiches, warm dishes including veggie, halal, jerk chicken. Tom's Kitchen Deli is more expensive but some say is better. Cheapest of all is Tesco's - there are a few but the closest to the court is the one which you can access from platform 6 at the DLR station. See Map below. Red Box is the court. Red Arrow is route from the DLR. 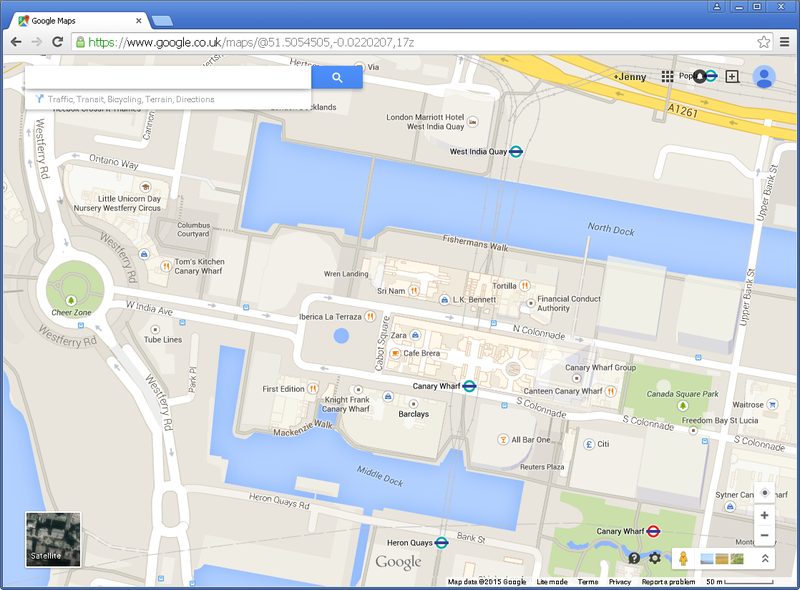 Black Arrow is the route from the Tube. NB. The subject line of the email should contain the case number, date of hearing and name of allocated Judge. No other correspondence should be sent to this email address. NB. The name of the case, case number and name of the allocated Judge should appear in the subject line. No other correspondence should be sent to this email address.